Magnuson Hotels, the world’s largest independent hotel group, announced today the complete rebranding of the M-Star Virginia Beach Norfolk. Formerly franchised by Wyndham as the Days Inn Norfolk, the hotel will upgrade its local, regional, and national market to attract business, group, and leisure travelers via an affiliation with Magnuson Hotels’ global portfolio of nearly 2,000 hotels. 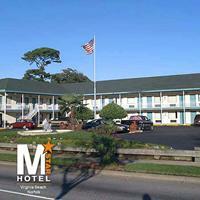 Corporate, educational, government, and leisure travelers will appreciate this 105-room facility ideally located near Amphibious Base on Shore Drive, Norfolk Beach, Virginia Beach Oceanfront, Norfolk International Airport, Chesapeake Bay Historic landmarks, museums, theme parks, and popular golf courses. The pet friendly M-Star Virginia Beach Norfolk offers a complimentary breakfast, outdoor pool, exercise room, and guest laundry facilities. Additional amenities include complimentary parking and wireless internet access. All guest rooms are ideally equipped with microwave, mini-fridge, hair dryer, coffee maker, cable TV, free local calls, alarm clock/radio, and air conditioning. “We are proud to welcome Kirit Amin and his entire staff, and are fully committed to increasing their property visibility and reservations,” stated Thomas Magnuson, CEO of Magnuson Worldwide. As a Magnuson Hotels affiliate, the M-Star Virginia Beach Norfolk is a member of the Magnuson Hotels Premier Collection, an elite portfolio of the highest quality hotels and locations represented by Magnuson Worldwide. The M-Star Virginia Beach Norfolk will receive complete global brand representation without the costs and requirements of franchise brand affiliation. It will expand its business through Magnuson Hotels’ massive hotel reservation network including 650,000 GDS travel agents, all global corporate accounts, over 2,000 internet booking channels such as Global Hotel Exchange, Expedia, Hotels.com, Priceline, and all major airlines websites.